A widget that allow user to set up properties in a table or a tree table. By default, the table shows items in categories, the "sort" and "show description" buttons are displayed, and the description panel is present. String description: The description (if the description panel is shown). You can use the following HTML tags for the presentation : <b>, <i> and <u>. boolean enabled: if true (default value), the property can be modified. If no editor is set, the PropertyTable will use by default the PTStringEditor. This editor is used to modify any kind of property. It is represented by a Text widget. This editor is used to modify an Integer. It is represented by a Text widget that accepts only integer values. This editor is used to modify a Float. It is represented by a Text widget that accepts only float values. This editor is used to modify an Integer. It is represented by a Spinner widget. 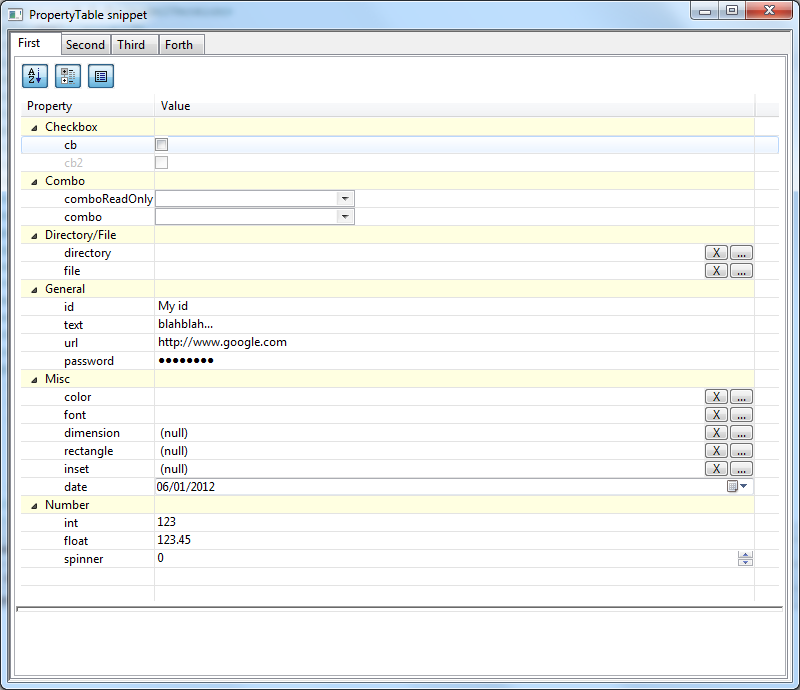 This editor is used to modify any kind of property that correspond to a file path. It is represented by a text with 2 buttons. The "X" button erases the value of the property (set it to null). The "..." button opens a new window that allow the user to pick a file. This editor is used to modify any kind of property that correspond to a directory path. It is represented by a text with 2 buttons. The "X" button erases the value of the property (set it to null). The "..." button opens a new window that allow the user to pick a directory. This editor is used to modify any kind of property. It is represented by a Combo widget. The PropertyTable uses the toString() method of the object to display value, so you can use a Java Bean. This editor is used to modify a boolean property. It is represented by a Checkbox widget. This editor is used to modify A Color. It is represented by a text with 2 buttons. The "X" button erases the value of the property (set it to null). The "..." button opens a new window that allow the user to pick a color. This editor is used to modify a Font. It is represented by a text with 2 buttons. The "X" button erases the value of the property (set it to null). The "..." button opens a new window that allow the user to pick a Font. This editor is used to modify a date (no time). It is represented by a DateTime widget. This editor is used to modify a Dimension. It is represented by a text with 2 buttons. The "X" button erases the value of the property (set it to null). The "..." button opens a new window that allow the user to enter the width and the height of a dimension. This editor is used to modify a Dimension. It is represented by a text with 2 buttons. The "X" button erases the value of the property (set it to null). The "..." button opens a new window that allow the user to enter the x coordinate, the y coordinate, the width and the height of a rectangle. This editor is used to modify a Insets object. It is represented by a text with 2 buttons. The "X" button erases the value of the property (set it to null). The "..." button opens a new window that allow the user to enter the top, the left, the bottom and the right part of an insets. You can add a PTPropertyChangeListener that is called when the value of the property has changed. The method is called addChangeListener(). If you wish to update the values, just call the methods setProperties() or refresh. 2 snippets called PropertyTableSnippet and PropertyTableSnippetRefresh are available in the plugin org.eclipse.nebula.widgets.opal.propertytable.snippets.